This article will try to explain the mechanism of how a trap actually works. As Darwin describes, this rapid plant movement is one of the most wonderful things on earth. It is based on a scientific article written by Alexander Volkov et al. [Kinetics and Mechanism of Dionaea muscipula Trap Closing; 2008, Plant Physiology, 146 [694-702]; Alexander G. Volkov, Tejumade Adesina, Vladislav S. Markin, Emil Jovanov] and if you want to learn more I’d recommend reading this article. As most of you already know, it requires 2 stimulations of a trigger hair within 35 seconds in order to close a trap of the VFT, and we all know why the plant responds like this, to rule out sand or rain as prey. But what this article will try to clarify is what happens in the trap lobes when these trigger hairs are being stimulated. It is clear that some level of communication between all the cells in the traps is required to pull off an orchestrated response as rapid closure of the trap. And different kinds of communication exist within plants, much like in animals. Cells can communicate with each other by pores they have in their membrane, which takes care of ‘direct neighbor cell communication’ but like animals, plants can also use electrical signals for ‘long distance communication’. Specifically in the Venus Flytrap, there is electrical communication between the trigger hairs in the center of each lobe towards the midrib [the part of the trap where the two lobs come together and where the trap is connected with the rest of the leaf]. The nature of this electrical signaling explains why 2 stimulations are required and why these 2 stimulations need to occur within 35 seconds. Figure 1: The above graphic shows the strength of the electrical signal over time. The Threshold value line is the minimal strength of the signal that is required for the trap to close. The red line is the first stimulation of a Trigger Hair. As we can see, one stimulation is not enough to reach the threshold value. The green line is a second stimulation shortly after the first one. The Threshold value is exceeded and the trap closes. The blue line represents a second trigger (after the red one) which is just a split second too late to trigger a response. A single triggering always leads to an electrical response of the same magnitude. 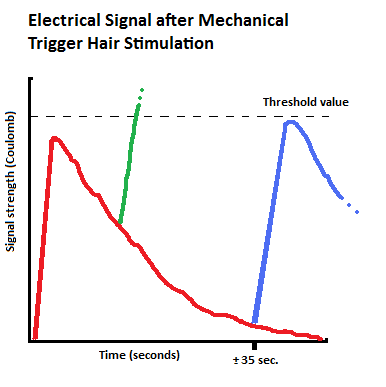 As we can see in Figure 1, when a Trigger Hair is stimulated, there is an almost immediate electrical response, which reaches it maximum very fast [less than 0.1 second in reality) and then slowly dissipates. A second trigger, which will have the same electrical response in strength and in time, is needed to close the trap [reach the threshold value]. When this second trigger occurs fast enough after the first [see the green line] the trap will close. When the second trigger takes too long to occur after the first [see the blue line] the trap will not close, but a new period of ± 35 seconds is started in which a third trigger can still close the trap if it occurs fast enough. that in temperatures of over 36˚C only one trigger is required to close a trap? that a trap closes about twice as fast at 20˚C compared to 36˚C? that a trap closes automatically in an acid environment with pH less than 4.5? What happens when the trap receives the signal to close? When the electrical signal exceeds the threshold value, it will take 0.3 seconds for the trap to close enough to keep it’s pray caught. But how does this change of open state to closed state occur? The electrical signal that arrives in the midrib of the trap has a few consequences but they all boil down to the same effect. To understand this effect, we must first describe the trap a bit. 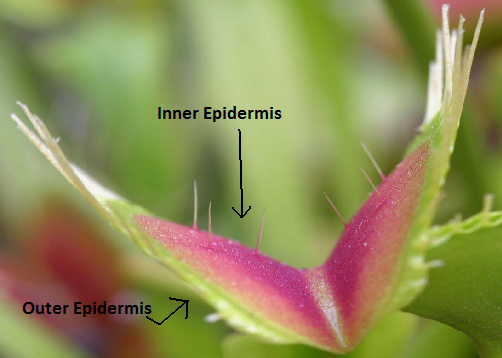 Figure 2: The inner epidermis is the layer of cells on the inside surface of the trap and they contain the 3 trigger hairs. They are inaccessible when the trap is digesting. The outer epidermis is the layer of cells on the outside surface of the trap. You can still see and touch these even when the trap is digesting. The mesophyl is inside the plant, and consists of multiple layers between the inner and outer epidermis. As you can see on Figure 2, the trap lobes are thicker as we move closer to the midrib [the whitish part in the middle of the inside of the trap]. When the trap is in the open state, the mesophyl cells that lay just beneath the Inner Epidermis surface cells are ‘blown up’ with water, creating a turgor on the cells (a kind of tension, compared to the tension you see on a balloon when it’s blown up), while the mesophyl cells that lay just beneath the Outer Epidermis surface cells have very little amount of water. This imbalance in turgor pushes the two lobes of the trap away from each other and the trap is in the open state. The inside of the trap resembles two convex surfaces. Now, when an electrical signal of sufficient strength [see above] reaches the midrib, it triggers [amongst other effects which are not discussed here] the opening of so-called Aquaporins. Aquaporins are pores in membranes of cells which allow water to travel from one cell to a neighboring cell that is connected with this aquaporin. When aquaporins are opened, the imbalance in turgor between the inner and outer layers of mesophyl cells disappears and a new equilibrium state is formed. In this new equilibrium state, there are two general observable effects. The first is that the two lobes go from a convex state when open to a concave state when closed (when looking at the inner epidermis). The second is that the cilia (the fingers) of the traps bend over towards each other and prevent the prey from escaping. Since aquaporins can move a lot of water on a short period of time, this ‘restoration of turgor imbalance’ explains the rapid phase of initial trap closure. This also explains why the reopening of a trap is a slow process, since there is an imbalance that needs to be built up again. When the trigger hairs are continuously stimulated, this rebuilding of imbalance process is arrested and the leaves slowly continue to close. When the two edges of the lobes touch each other, a whole new phase is started in the process of digesting insects.